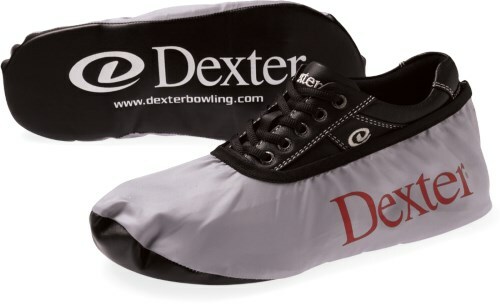 Protect your bowling shoe investment with the Dexter Shoe Covers. These shoe covers are designed to protect your slide sole during off-lane use. The synthetic bottoms protect and offer durability while the fabric upper has an elastic opening for a snug fit. My original Dexter shoe protectors came with my Dexter SST 8 shoes nearly five years ago. One of those came apart along the elastic. I bought another pair more about three years ago and both of those failed the same way. These new Dexter shoe protectors have a different fabric that itself stretches. Whether this helps is something we'll see. They certainly are much easier to put on than the previous product. SST 8's are bulky and bigger than most bowling shoes and that causes a maximum stretch. We all know the original Dexter shiny silver shoe covers that come with your new pair of Dexter shoes. Apparently they have changed them going forward. The picture depicts what I described above, however what was received was a spandex material, the color is muted compared to the originals. Ordered the same size as the originals before but the new ones run big. Size 11 shoe wearing a Large normally, and this large would fit a 15. Too much room around the shoe and extra at the toe and heel to trip on. Great question! The $16.99 price above is for a pair of Dexter Shoe Covers. The shoe chart shows that a women size 9 would be a small shoe cover. This is the largest size a small will fit so it may be a tight fit. If you were wanting to get the medium, it may fit the shoe loosely but it may be easier to slip on and off the shoe. I wear a size 12 bowling shoe. Would it be better if I ordered the men's large shoe cover rather than the men's medium shoe cover? Yes, I would order the large just in case the medium's don't fit. Due to the time it takes to produce the Dexter Shoe Covers ball it will ship in immediately. We cannot ship this ball outside the United States.